Everton secured their first Women's Super League 1 win of the season after beating Yeovil Town 2-0 at Huish Park. Both teams went into the game having picked up no points in 2017/18, but the Blues left with all three thanks to goals from Courtney Sweetman-Kirk and Chloe Kelly. The visitors enjoyed the early pressure and made the breakthrough on 17 minutes as Sweetman-Kirk was played in behind as she lifted it over the onrushing Megan Walsh and into the back of the net. The striker should have made it 2-0 six minutes later when again she broke clear of the home defence but this time Walsh did enough to put her off and the shot drifted just wide. At the other end, Yeovil had a great opportunity themselves shortly afterwards as an Ellie Curson cross found Ella Pusey, but despite being unmarked she put her downward header inches wide. In the second half, the away side continued to enjoy the majority of the possession and chances, with Angharad James stinging the palms of Walsh with an effort that was gathered at the second attempt. 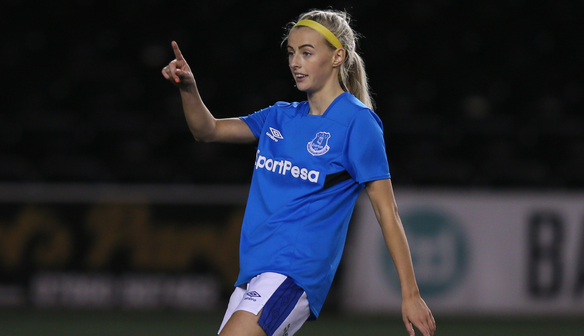 The Toffees' second goal did eventually arrive from the penalty spot in the 60th minute when Nicola Cousins brought down Sweetman-Kirk in the box and Kelly stepped up to convert from 12 yards. Everton kept their composure to see out the match, while for the Glovers that is now five WSL outings this term without any points or any goals. "It was time that we got our first three points. We've been having good performances but not the points on the board. "I think in this game we got the early goal and proved that we deserve to be in this league. It's not just how we got promoted but we deserve it and I think we showed that on the pitch. "We were confident because we've had great performances the first few games against tough opposition and we deserved to get a bit more out of the games and were a bit disappointed we hadn't. "Against Yeovil was always going to be a tough game and more of a fight than a game of football but we got the three points. "I was really happy to get on the score-sheet. It's nice to get a goal and when we got the penalty I thought 'I'll take it' and I put it in the bottom corner." "We're obviously disappointed but I feel we did try our best and that's the best performance we've had all season. “We went out there and we tried to play and I don't think you can fault the girls, I just think we were unlucky. Everton took their chances and we unfortunately didn't. "I would say Everton deserved to win the game but it was a narrow defeat and I'm happy with the overall performance and hopefully it's upwards from now. "I think work rate and work ethic was something we needed to go out and show today and I think we did a good job of that. "I think a little bit of luck is needed to come our way and we owed a bit and I think once we get that first goal they will continue to come, but it's getting that first goal. If we continue to work as hard as we did today it will come."